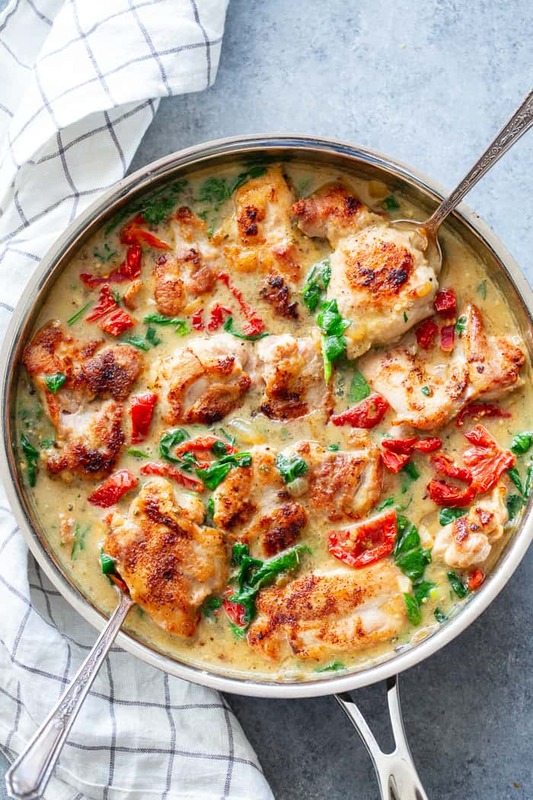 This creamy paleo tuscan chicken is a super-tasty one-skillet meal that’s perfect for weeknights and full of flavor! 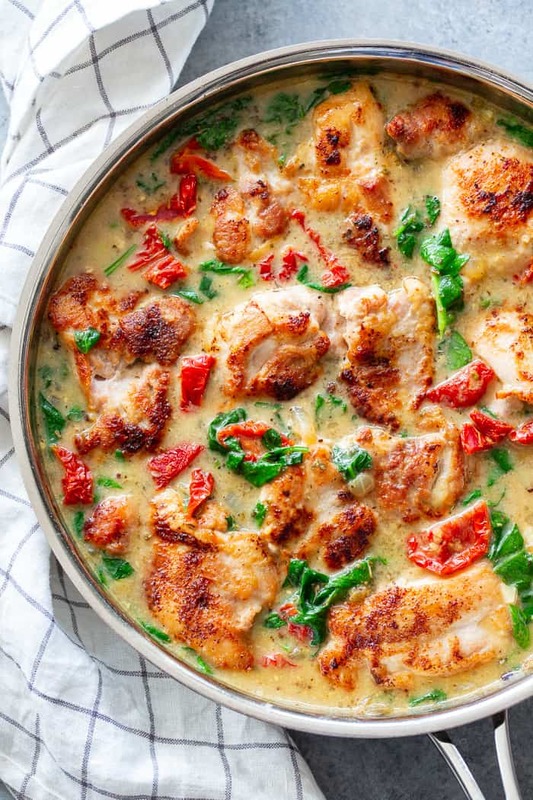 Boneless, skinless chicken thighs are seared and cooked with a creamy sauce packed with spinach and sun-dried tomatoes. 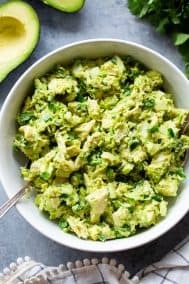 Paleo, dairy-free, Whole30, and Keto friendly! One-skillet dinners make my ain’t-no-time-momma heart sing. That’s a real thing, of course. And by “heart singing” I just mean I feel approximately 15% less stressed out by the chaos of life when I know I can make dinner in just one skillet. I’m sure there’s at least a few of you ladies out there who can relate! When there’s only one skillet needed to cook dinner from start to finish, it gives me hope that I can, in fact, make it to 9pm without a complete meltdown. 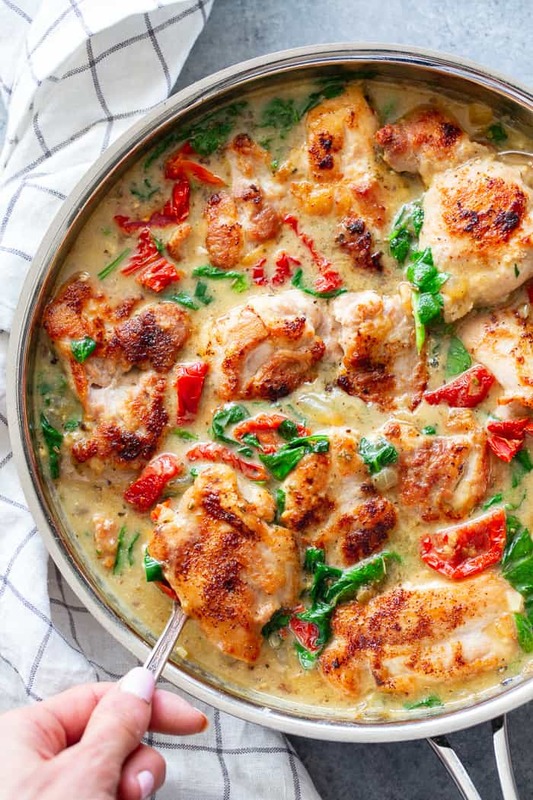 Not anything to take lightly – we need these one-skillet meals. Okay, hopefully I’ve sold you on the one-skillet thing but if not, I’m sure I will with everything else about the actual recipe. 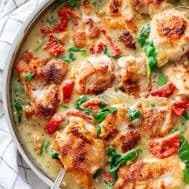 It’s a creamy Tuscan chicken that’s totally dairy-free, paleo, gluten-free and packed with veggies! It’s relatively low in carbs as well, with the only carb source really being the sun-dried tomatoes. If you’d like an even lower-carb keto option, you can always use fewer sun dried tomatoes. For the chicken, I knew from the start I’d have to go with boneless skinless THIGHS, not breasts. Breasts are great if you’re “breading” your chicken but honestly they are way too dry in my opinion for anything else – even a creamy sauce. The thighs cook almost as quickly and they have 10x the flavor, crispiness, and juiciness of the breasts. We’ll season them, sauté, and then remove from the skillet while we make the yummy sauce. So yes – it’s one skillet only, but, you’ll need a plate of some sort. Use a paper one if you’re like me and can’t stand the thought of another dish! The sauce itself is similar many creamy sauces I make – a combination of chicken bone broth and coconut milk, with some tapioca to thicken. 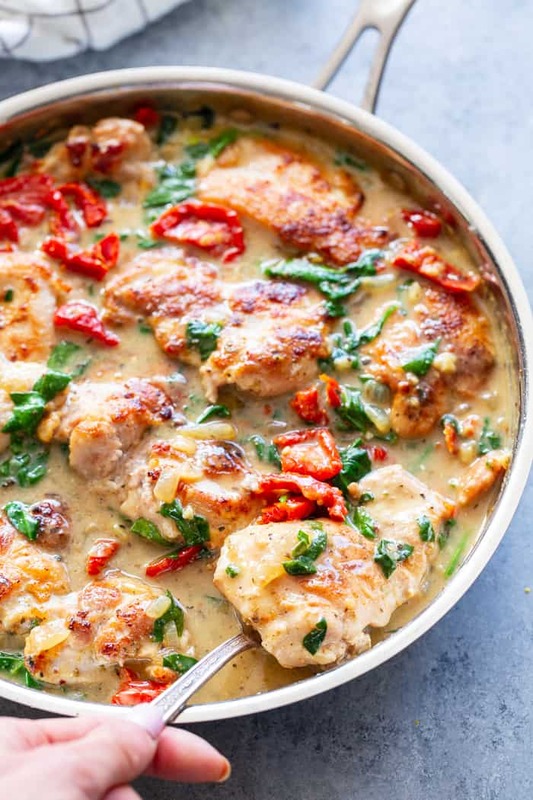 I add a little stone ground mustard and nutritional yeast as well, which, in my opinion, cuts the flavor of the coconut milk enough so that you can barely taste it. I know many of you are sensitive to coconut flavor, so if you really want to cut the taste, you can use a bit more tapioca to thicken, more broth, and less coconut milk. But, I encourage you to try the recipe as written since the coconut flavor is really quite minimal! I hope you’re ready for a full-of-flavor, one-skillet meal that you’ll want to throw right into your dinner rotation ASAP! Grab your chicken and a nice big skillet because it’s time to cook – let’s go! Season the chicken with sea salt, pepper, garlic, and onion powder. 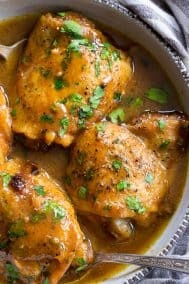 In a large skillet add the coconut oil and cook the chicken thighs on medium-high heat for 5-7 minutes on each side or until browned and no longer pink in center. Remove chicken and set aside on a plate. Add additional oil if necessary and cook the onions over medium heat until soft, then stir in the garlic and cook another 45 seconds. Whisk in the tapioca or arrowroot, the add the broth and coconut milk. Stir to combine, then stir in the mustard, yeast, Italian seasoning, sea salt and pepper. Cook and stir over medium-high heat until it starts to thicken. Add the spinach and sun-dried tomatoes and allow mixture to simmer until spinach is wilted and tomatoes are softened. Add chicken back to the skillet and simmer another 2 minutes. Serve over cauli rice, zucchini noodles, or with roasted potatoes. Enjoy! 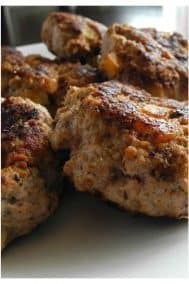 Want More Paleo Chicken Recipes?! Try One of These! Looks delicious! Could I use almond milk instead of coconut? Made this tonight. Oh my yummy!!! I increased the liquid because I like lots of sauce. Thanks for the great recipe. This looks delicious! Any recommendations to substitute for the the full fat coconut milk? My husband is allergic to coconut, but I would love to make this recipe! This sounds and looks absolutely delicious! A warm, creamy, and hearty meal! Yum! Another great recipe! My husband and I both enjoyed it. I shouldn’t be surprised, we love all of your recipes!! This was amazing! So flavorful and pretty easy. My husband and kids loved it. Served it with white rice for the kids and cauli rice for the adults. Would also be great with mashed potatoes/cauli! I made this for company and it was great. I love your recipes. Thank you. 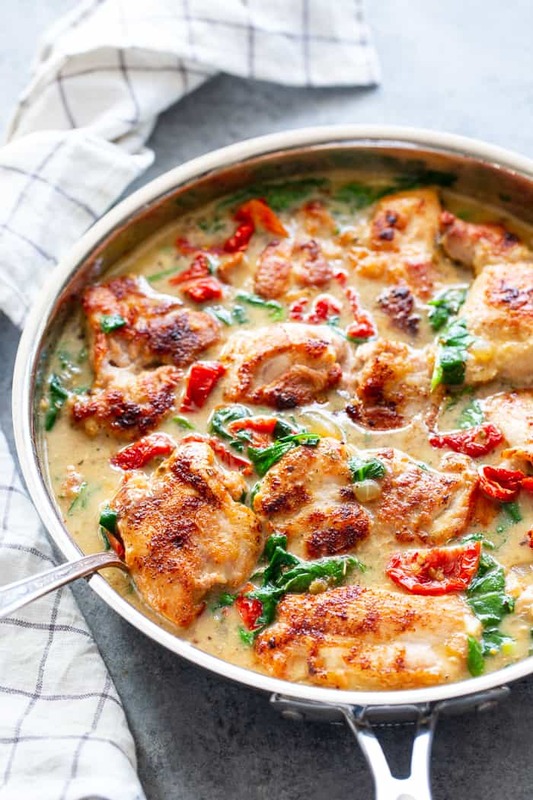 Your Creamy Tuscan Chicken pictures make me hungry!! What happens if I leave out the garlic? This was absolutely delicious. And super easy. Very delicious meal, better than with dairy products. My non paleo son (19) even liked it. This was so delicious. I added some basil. Yum. Loved this recipe! Also added some mushrooms along with the sun dried tomatoes and spinach. Made this for company and it was great. Will make again.